Mama Fashionista: Make Your Skincare Routine Interesting with Unique Ingredients! 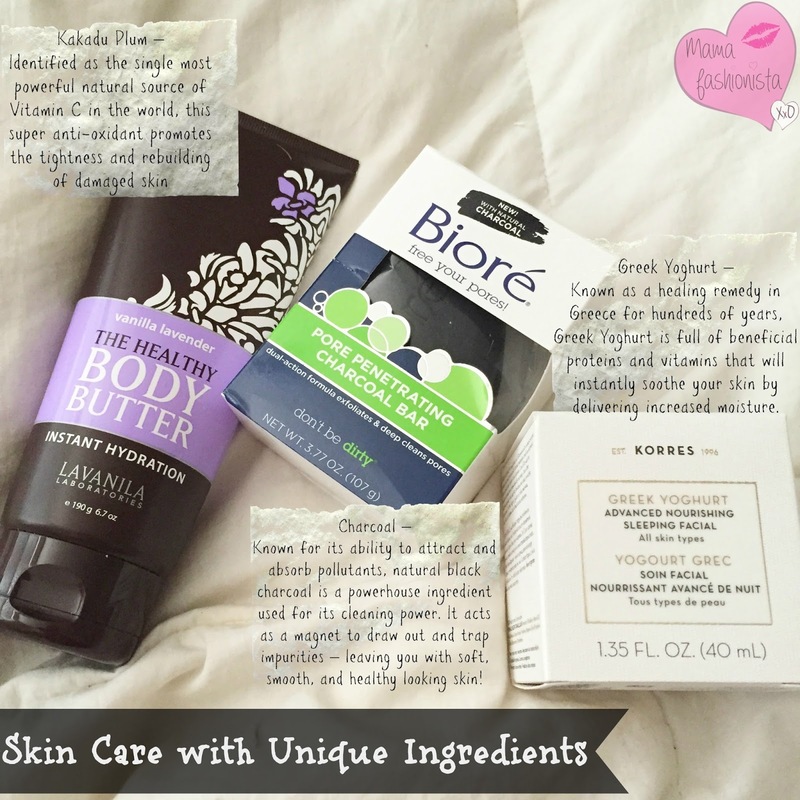 Make Your Skincare Routine Interesting with Unique Ingredients! Bioré Pore Penetrating Charcoal Bar ($6.49, www.biore.com) – Liquid cleansers have their place, but some of us just prefer a bar experience. For those who like to hold pore cleansing power in the palm of their hand, this new cleanser features a dual action formula to exfoliate while deep cleaning pores. This cleanser draws out and binds to deep down dirt and oil for 2.5 times cleaner pores than a basic cleanser. With jojoba beads and peppermint, the formula gently exfoliates and leaves skin feeling refreshed and smooth. Korres Greek Yoghurt Sleeping Facial ($45; Sephora.com) – This ultra hydrating facial-in-a-jar contains a Greek Yoghurt concentrate with two and a half times the protein content of regular yogurt, and works overnight to provide skin with intense, long-term moisturization and nourishment to create a smooth, even complexion. You will wake up to noticeable improvements in skin texture and more moisturized, refreshed skin. ESPA Optimal Skin ProCleanser ($55;us.espaskincare.com) – A tri-phase multifunctional gel cleanser, exfoliator and mask that will leave your skin feeling beautifully clean, nourished and visibly radiant. Moringa seed extract cleanses and removes make-up while multi-functional jojoba spheres gently exfoliate and melt to leave your skin clear, nourished and smooth. Finally, pumpkin enzymes gently dissolve dull cells, revealing a beautiful, radiant, healthy glow. Lavanila Laboratories The Healthy Body Butter Collection ($19; Lavanila.com) – These super soft, all-natural body butters absorb instantly for deeply hydrated, luxuriously soft skin. 100% pure Shea & Cocoa Butters blend with powerful antioxidants and essential oils for long-lasting hydration. With super soft scents and a non-greasy formula, prepare for the ultimate indulgence. Available in Fresh Vanilla Lemon, Vanilla Summer, Vanilla Grapefruit, Pure Vanilla and Vanilla Lavender.